When people talk about Japanese food, they almost always talk about sushi. Sushi is the most recognized food from Japan, but it isn’t the most popular food. It is traditionally eaten only on special occasions. To think that people in Japan would eat it every day, or even every week is a very strange concept to Japanese people. They might eat it when people visit, or to celebrate a special occasion. That’s not to say that you can’t find sushi and sashimi everywhere. They key to making sushi isn’t within the fish itself. The rice is the most important ingredient, in my opinion. When you visit North American sushi restaurants, you can find a few good ones with good rice, but the majority have terrible rice. It either has a strong taste of vinegar, or there is no taste at all. It can be too wet, or too dry. In the worst case, they use the wrong type of rice! Sushi must be made with the proper Japanese rice. Without it, the sushi won’t hold together, or it will be too wet. Then, you have to mix the proper ingredients to make it taste better. Once that is done, you can start to make sushi. Getting this done right is extremely difficult, and even for the typical Japanese person, it’s nearly impossible to get right all the time. It can be so difficult, that it’s definitely more common to see Japanese people head to the shops to get their sushi. The second major misconception about sushi is that there are rolls. If you visit a typical sushi restaurant, you will rarely see any rolls of any type. The typical kappa (cucumber) and possibly negitoro (ground up tuna) rolls are possible, but not very common. The key, when eating sushi, is to look more for the varieties of fish. Tuna itself has three cuts that provide a very different and distinct flavour. There is Akami, Chu-toro, and O-toro. O-toro is the fattiest part of the tuna, where Akami is the meatiest. Which you prefer will depend on your own personal tastes. I prefer Akami, but O-toro is the most expensive as it has the texture of butter. You will be able to see various specials where the fish may or may not be cooked, and you can also see meat on sushi. Unfortunately, if you cannot speak Japanese, or if you can’t read Japanese, you will have a tough time finding the specials. If you visit one of the major restaurants, they may have English menus, but if they don’t, just point and ask, or just order something and hope it tastes good. It’s the only way to see if you’ll like it or not. When going out to eat sushi, you can eat in three major styles. There is the typical restaurant that sells sushi. These can usually be found on the top floors of the department stores. They tend to be a little expensive, but they do have all you can eat. The quality is pretty good and it will be fairly tourist friendly. There are small shops located around many other cities, but these shops can be a little intimidating to enter. 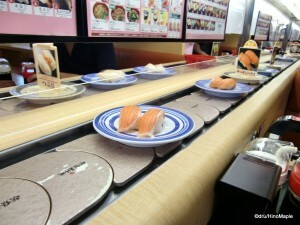 The second most popular way to eat, and the best for tourists, is the kaiten sushi. 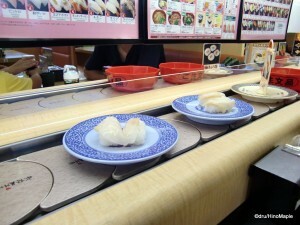 This is the conveyor belt sushi. Basically, the sushi chefs will make a bunch of sushi, put it on the belt, and you can pick and choose to your delight until you are full. Do note that if you do visit one of these shops, you will more than likely miss out on a lot if you don’t order from the chefs themselves. It’s very simple to ask for something, but since there are no menus in English, it can be very difficult. You can always point to something and ask for it that way. Do beware that the quality of the sushi at these shops can vary wildly. One shop can be delicious, while another isn’t. If they advertise for 105 Yen per dish, it’s probably not very good. If they have various trays that are colour coded to the price, then you will get decent to good sushi. The final way to get sushi is to go to a standing sushi bar. These shops are not foreigner friendly as they people who usually visit these shops are businessmen and business women looking for a quick light meal before they go home. It’s almost always order from the menu, which is rarely in English, if at all. It’s isn’t comfortable either as there are no seats. Finally, you can have a sushi donburi. This is a type of cross between sushi and non-sushi. Basically, you will get your raw fish on a bowl of rice. I personally find this to be another dish that should be tried. You can either get a simple donburi, or you can get one that is very complex. The simplest ones have nothing but one type of fish, but the better ones have three to 8 types of seafood on rice. Typical toppings include tuna, ground tuna, squid, and fish eggs. While this can change depending on the shop, it is still a delicious meal and recommended to anyone and everyone. This is also very cheap. 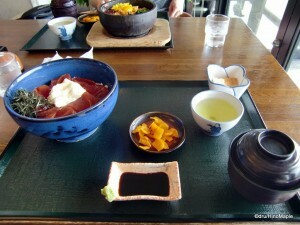 A typical donburi will start around 500 Yen and increase up to 2000 Yen. Do be aware that the quality will depend on which shop you go to, and where it is located. The best place for this type of sushi is to head to the stalls outside Tsukiji. They tend to be the best overall, and they aren’t very intimidating. Just point to what you want and you’ll get a great meal. This entry was posted in Food and tagged Chu-toro, conveyor belt sushi, donburi, Hon-maguro, japan, kaiten sushi, kappa, maguro, maki, negitoro, O-toro, sashimi, sushi, toro by Dru. Bookmark the permalink. Very informative, my friend. Can’t wait for the next one! Glad you like it. Got a bunch lined up. If you ever come over to this side of the pond, I’ll definitely take you around. Sweet! I’ll hold you to do that! “There is Hon-maguro, Chu-toro, and O-toro. 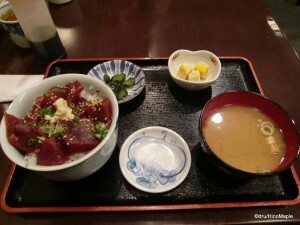 O-toro is the fattiest part of the tuna, where hon-maguro is the meatiest. Which you prefer will depend on your own personal tastes. I prefer Hon-maguro…” Errr, you might want to fix the glaring mistake here: hon-maguro (本マグロ) is a bluefin caught in Japanese coastal waters – not a cut of tuna. Akami (赤身) is the lean cut. Oops. You are completely right! I should have known that. I don’t know what I was thinking when I wrote that. It is all fixed now. Thanks for pointing it out.